....well in sweater land anyway! 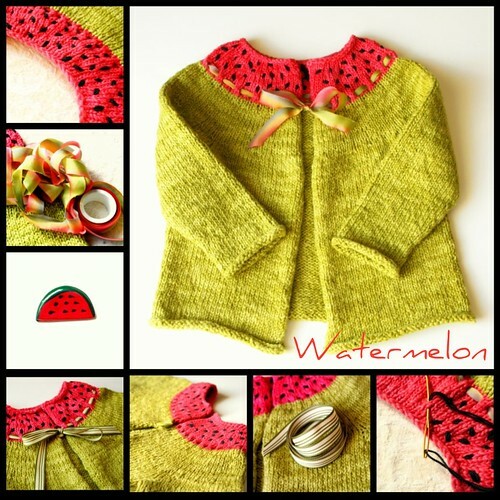 I am now finished with the Watermelon sweater and I love it! I am so happy that I made the 2T size for my daughter. It fits perfectly!!! I will be getting this pattern sized and it will be available for purchase shortly. My little one has been visiting Grandma and Grandpa all day so I have been feverishly working on the finishing details. If you notice from the above pictures I've had some difficulty deciding whether to go with a ribbon tie closure or a button and loop closure. I think that I will offer both options in the pattern. If you notice, I show the sweater with a more froo-froo dressed up ribbon and then with a plainer ribbon for a more casual style. I chose the green striped one for the photo because it resembles watermelon rind. How fitting. I especially love the hand dyed silk ribbon. It makes the sweater look so feminine and lovely. I think that the ribbon tie closure option looks a bit too babyish for the 2T size. But however it would look so precious on the sizes for smaller babies. Since my 3 year old is now a "big kid" Ive decided to go with a button and loop closure and keep the eyelet row as just a nice added detail. I will be sharing modeled shots of Watermelon soon!